With Air Asia, now everyone can fly. With karaoke, now everyone can sing. Well in fact without karaoke everyone who can talk can sing also, right? The thing is that some people sing better than others. But karaoke does make a difference. It makes learning to sing so easy and makes amateurs sound like professionals. I have always loved music. I loved to listen to songs. In the good old days, we used to keep song books with lyrics of songs. 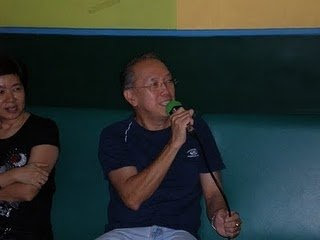 Before karaoke, many of us would know how to strum some basic chords and sing along. We would figure out the chords and just strum the rhythm by just following our ear and feel. 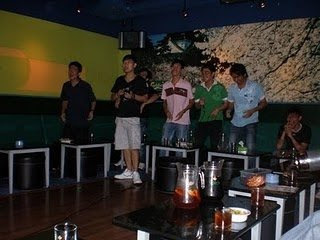 Now with karaoke, we have the background music, the lyrics appearing at the right time to prompt you and you can even adjust the key to suit your voice. Those days we have to arrange the chords to a different key. With this technology, singing is much easier now. But it is not as easy as it appears to be. Some people sound better than others and it still needs some effort to sound good. In this post I will share my tips on karaoke singing. First, the voice. Some people have a nicer voice than others. But this actually a relative thing. We sometimes hear singers who sing as though they have a sore throat and yet they can be popular. The overall presentation can make a difference. But anyway, remember, I'm talking about karaoke singing so it doesn't really matter. Many people who have heard me sing have told me i have a nice voice (maybe out of politeness?) but I think its my choice of songs. We have to know our own voice and the type of songs which suit our voice. Basically I have a low voice and the crooner rather than the rocker or rapper type. But then if the song is written at a too low range, my voice would sound too monotonous. So the way is to try out various songs and find your songs to add to your repertoire. For me, my voice is more for the romantic love songs but sometimes I do sing lively and fast numbers too. My vocal range is quite limited and if I sing certain songs originally sung by male singers sometimes I need to bring down the key. There are some singers whose songs are in the mid-range and fits the tag..everyone can sing. For example Teresa Teng （邓丽君) songs are easy to sing so it explains her popularity..of course she had a very melodious voice which so far no one can equal. I can't sing 庄学忠 songs even though many men like to sing his songs. I 'll need to adjust the key for these songs. My CD collection has many golden classics which are at the key that everyone can sing. Besides the golden evergreens, I can also sing 張惠妹 Amei, 鄭秀文 Sammi Cheng, 許茹芸 Valen Hsu, 林憶蓮 Sandy Lam, Stephanie Sun 孫燕姿 numbers. On the contrary some ladies might find these songs difficult. 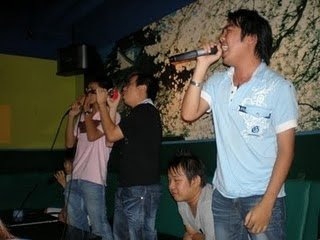 For male singers, there are certain songs by 張信哲 (Jeff Chang), 任贤齐 (Richie Ren) ,林志炫 (Terry Lin) and 周華健 (Emil Chow) that are suitable for me to sing. The trick is, as I said, knowing your voice. And we need to try out before we know it. I know my limitations and I'll sound awful for certain songs. Some people have wider range of songs they can sing, some people have limited...nobody can sing all songs. Again, I'm not talking about professional singers but ordinary karaoke buffs like us. Second is the pitching. 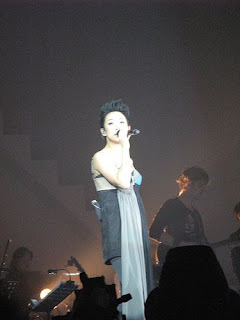 What people usually describe as singing off-key or 走音, means to sing at the wrong pitch. It's not as easy as it looks. Some people can identify the pitch in their head (not necessarily knowing the actual pitch) some people cannot. Some people know the pitch but cannot sing the correct pitch. That's why some people don't even know they've gone off pitch. But this thing can be cultivated. Those who listen to a lot of music or play musical instruments can pitch better. But there are people who can play and identify pitch but find it hard to sing it correctly. Some people pick up better than others, it's an inborn thing. but I believe practise does make a difference. When I sing some songs that I haven't been singing a long time, I know I've gone off pitch. Some people won't notice but when I look at the people who might know, our smiles confirmed that the mistake has not gone unnoticed. Third is the self-confidence, or guts. Some people have quite "thick skins" and are very bold to sing, croak or shout in front of others. Some people won't make a sound even if you put a gun on their head for fear of embarassing themselves (just joking). To sing well is one thing, but singing in public is another. Some people will sing along when a song is sung but when the mike is put near their lips they will stop immediately. Some people can sing very well but just refuse to sing in the presence of others fearing embarassment. Not many are bold enough for their voice to be heard through the sound system. But after they overcome the initial fear it comes easier. However there are some people who cannot sing well but yet love to belt out the numbers at every opportunity. . Actually it doesn't really matter whether you sing well or not. Its all for fun. As long as you have the confidence to come out of the shell and sing it out, its an achievement. We are not competing or trying to be professional singers. Singing is good therapy to relieve stress and boost your self esteem. You should try it. Karaoke can help build up our stage confidence. 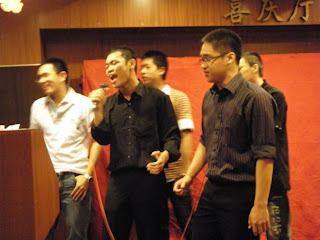 I've been up on the stage to sing in groups during college days. I also did a duet before more than twenty years ago in my former school. Later, with karaoke, I tried out many songs but it was all in the privacy of home. 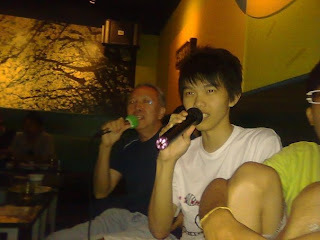 About 6 years ago, during a course I attended, we had karaoke sessions with some teachers. I got a lot of positive feedback which boosted my confidence. Then during the closing ceremony, when the VIP was late, some people called my name and requested that I sing and entertain them while waiting for the VIP to arrive. Stage fright or not, I delivered some easy songs without music and lyrics to prompt me. And I can tell you its not easy. We are so used to karaoke ...we will be lost without the help. I usually kept a low profile and would not volunteer or walk up to sing during dinners despite being able to do so. But one dinner started it all. Somebody leaked to my boss that I sang during a course so he made me sing during the staff dinner. 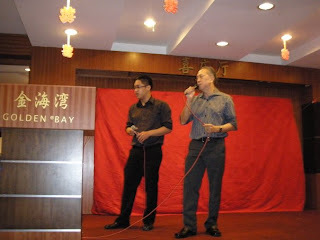 The next year the organisers asked me to prepare karaoke with a few other teachers to entertain. The following year we tried something more difficult. singing on stage with background music but no screen to peek at the lyrics. This was something else. We had to memorise the lyrics and know exactly when to come in. This wasn't the difficult part. Without the screen to look at, you had to look at the audience and also know how to stand or where to put our hands. But we just held the mike and the wire and just walk around the stage! And it can be quite an experience, enough to make you shiver with stage fright. Then during a Form 6 dinner 2 years ago, the students started calling teachers to sing. None of the other teachers would be willing to do such a thing , so I had to go up so as not to disappoint the students. So I took the cordless mike, sang an easy 月亮代表我的心, walk round among the audience just like a superstar(haha) But that way I didn't have to stand hundreds of eyes staring at me singing without music, that way they all sang , waved and laughed with me when I teased the other teachers with the mike. This year they asked me whether I want to perform or not. My answer was quick "No!" Perform? I was attending a thanksgiving dinner. perform? Not me! But when somebody suggested doing a duet with me, I thought , why not? I have sung duets before with other students so it would be nice, just to show the closeness between the teachers and students.